The Converse Blog: The Converse Blog: Converse 0100 Celtics Colorway. The Converse Blog: Converse 0100 Celtics Colorway. I apologize for the late post today, but I had a crazy day being an 8th grade Science teacher. Today's post, which is normally a Friday Flashback, is pretty exciting for me. 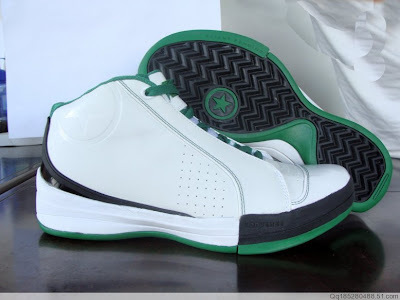 Today we have the Converse 0100 in a Boston Celtics colorway. If you can't tell, I love these shoes. They're extremely comfortable and I can't wait to see them on the NBA courts soon. Well that's it for today, thanks for checking out the blog and come back for a visit soon!